As we grow older it seems as though we begin to fall apart in many ways. We lose muscle mass and bone density, gain fat mass, get poorer sleep, become more forgetful, are less resilient to stress, are more easily injured, and much worse at recovering from injury. Oops, forgot to mention our immune system gets crappier too. But is this just the way it is or do we have some level of control over it? I think to some extent it’s both. No matter what, we’ll never recapture that perfection of youth that we had in our 20s. But I don’t believe it’s out of line to say that a primary driver of the problems we encounter as we age are driven to a large extent by our behavior. Yes, we’ll lose muscle mass and bone density every decade after 30, but being sedentary makes this worse and having lower muscle mass and bone density going in to your 40s will always lead to less muscle mass in your 50s. Being sedentary will speed up these processes even further. Yes, we sleep less as we get older, but I think a large contributor to this is the way we live. Poor daytime light exposure and too much nighttime light exposure cause circadian disruption in everyone, but it’s worse as you get older. A recent review covers some of the mechanisms behind why this happens, and when we combine it with other data, we have some pretty clear insights as to how to prevent it. A recent review titled The interface of aging and the circadian clock lays down the basis behind why aging causes circadian disruption. Younger people seemingly hit their circadian stride even when they’re not exposing themselves to the proper zeitgebers, environmental cues that help set circadian rhythms throughout the body. That’s because there’s synchrony between the master and peripheral clocks. The master clock, located in the suprachiasmatic nucleus(SCN) in the hypothlalamus, is primarily regulated by exposure to light. It exerts some influence on the clocks located in every other part of the body, called peripheral clocks. However, the peripheral clocks are also regulated by other zeitgebers such as the feeding/fasting cycle, physical activity, stress, temperature, and social interaction. These other zeitgeber may also exert minor influence over the master clock. The feeding/fasting cycle appears to be the predominant zeitgeber for the peripheral clocks. I won’t go in to specifics here for reasons of brevity, but metabolism, free radical production, and the cell cycle are all considerations. It’s important to point out that this doesn’t make the other zeitgebers unimportant. What happens with aging makes a strong argument for addressing all zeitgebers. It’s probably no coincidence that decreased physical activity, high calorie intake, poor stress management, and social isolation tend to increase the risk for chronic disease. It’s also not surprising that doing the opposite of these things is often considered to be the drivers in increased longevity and decreased chronic disease risk in the Blue Zones. So what happens in aging that predisposes us to circadian disruption? While our clocks stay intact, the cells in the master clock don’t fire as rhythmically together as they did when we were younger. What we get is a decoupling of the master clock from the peripheral clocks which leads to metabolic dysfunction. This, in turn, can further disrupt circadian rhythms and cause the wheels to fall off, so to speak. Effectively what we get as we grow older is a greater susceptibility to circadian disruption. But to think this is simply a natural artifact of aging would require one to completely ignore the fact that older people in the Blue Zones are largely protected from these problems. In fact, a recent paper hypothesized that the longevity in the Blue Zones may be dictated by the robust circadian rhythms generated by these creatures of habit. Circadian rhythms are important at both the organ and cellular level. In order for our body to function properly, communication between organs and tissues that help regulate common biological functions needs to run smoothly. For example, the gut, kidney, liver, pancreas, brain, muscle, and fat tissues all help regulate our blood glucose levels. At the cellular level, circadian rhythms help separate processes that use the same substrates or that impede on one another. For example, we use the coenzyme pair NAD+/NADH to power energy metabolism, but some of the enzymes we use to repair damage to our cells consume NAD+ and convert it in to a form that can no longer function as a coenzyme in energy metabolism. Another problem is that free radicals are a natural byproduct of the electron transport chain, which is where we get most of our energy in the form of ATP from. Free radicals can damage cellular components, and having excessive free radicals when we’re trying to repair or replicate our cells can damage DNA or cause cell death. Optimizing circadian rhythms sets the rhythm so to speak by allowing use and repair to be separated from one another. By doing this, we can minimize the damage we accumulate every day and properly repair the damage that we do incur. 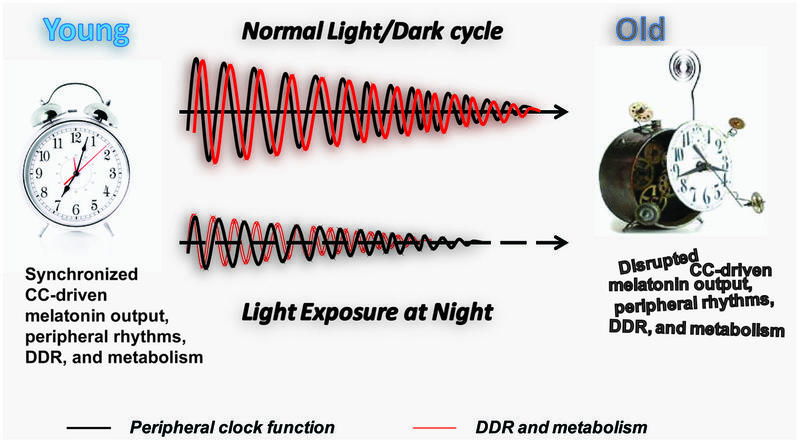 Being prone to circadian disruption from irregular zeitgeber exposure doesn’t change the fact that exposure to zeitgebers resets circadian rhythms every day. It just means that you need greater exposure to a variety of zeitgebers in order to get there. You also need to be consistent with your exposures. To use an analogy here, think of circadian rhythms as a puzzle with the different zeitgebers being pieces of the puzzle. When we’re young, we may only need 1 or 2 pieces of the puzzle to solve it. But, as we get older, some of the puzzle pieces fade so we need more pieces to solve it. In the same way, as we get older, we need more zeitgebers to optimize our circadian rhythms. But we don’t just need the environmental zeitgebers, we need the proper outputs from the organs controlled by the zeitgebers which requires proper layering of the zeitgebers. For example, fasting overnight causes the release of a molecule from fat tissue known as visfatin that increases NAD+ in the hypothalamus and may contribute to regulating the aging process. The myokine irisin, which is released from exercising muscle, and the adipokine adiponectin, which is released from fat, have been shown to increase brain-derived neurotrophic factor(BDNF), which plays a role in forming memories and mood and may help set the sensitivity of the master clock. Both of these signals are disrupted in the obese. Cortisol, regulated by the master clock as well as environmental stressors, plays a powerful role in nearly every physiological process in the body including gut function, the immune system, memory consolidation, sleep, and blood glucose regulation. Insulin is another big one regulated by feeding and activity, and how these hormones “play” with one another can be used to generate a more robust circadian rhythm than just playing around with light exposure and time-restricted eating. This has definitely been my experience as well as the experience of people I’ve worked with. A small amount of progress can be made by tinkering with light exposure and time-restricted eating. But for most people over 30, measurable progress requires also working on physical activity, a nutrient dense diet, and several nutrients that power the metabolic processes that drive circadian rhythms. It also requires something most people aren’t doing: actually measuring their progress. People love testing, but most of the tests they do are simply snapshots in time. Organic acids testing, Ubiome, comprehensive metabolic panels, and other tests performed every 6 months to a year are very useful to identify if you’re trending in the right direction, but relatively worthless at making change on the fly. This is why it’s important to have thing that you measure daily and weekly. When we work on circadian rhythms, we want to measure things that can illustrate progress on that front. Unfortunately, there isn’t a simple test to do this directly, but it is in the works. Instead, we should measure things that are valid outputs of circadian rhythms that can function as surrogate measures. Activity trackers are useful here because most measure things that are outputs of circadian rhythms. Sleep is a good one, as are heart rate and heart rate variability. These are regulated by the autonomic nervous system, which is one of the primary systems through which circadian rhythms exert their effects. I personally use a Fitbit Charge 2 HR to track sleep and heart rate, and spot check my heart rate variability 3 times per week with an app on my Iphone called HRV4Training. Blood glucose control is another useful measure. Continuous glucose monitoring(CGM) is the gold standard right now, but Hemoglobin A1c is much cheaper, easier, and requires less hassle. It’s important to point out that Hemoglobin A1c isn’t useful in some people due to a rapid turnover of red blood cells, but this isn’t an issue for people who have had high measures previously, as I have. For people where A1c isn’t valid, regular oral glucose tolerance tests(OGTTs) may be a good substitution until CGM becomes affordable and more available. I currently do a combination of both, checking A1c every 2 months and OGTT every 1-2 months. During an OGTT, you measure your blood glucose after fasting, typically in the morning. You then consume 75g of glucose in the form of a drink. Glucola is often used, but I typically use Gatorade as it’s easier to find and tastes much better. After consuming the drink, you measure your blood glucose level every 30 minutes for 2 hours. Your glucose should rise to no higher than 140mg/dL and drop back to fasting within 2 hours. When we look at these measures, it’s easy to see why they’re good for measuring progress in trying to optimize circadian rhythms. They’re literally at the intersection between zeitgebers and their outputs. Sleep, heart rate and heart rate variability will be strongly influenced by the cortisol rhythm. Blood glucose will be strongly influenced by the insulin and cortisol rhythms. And both the insulin and cortisol rhythm will be regulated by light exposure, physical activity, stress, the feeding/fasting cycle, and sleep. At this point, I’m pretty much dialed in. Sleep is great, blood glucose perfect, and I feel better than I ever have, even compared to 20 years ago. Without measuring the above and being able to see how everything tied together to make changes, that would have never happened. As we get older, the circadian clocks in our body become more prone to circadian disruption when exposed to irregular zeitgebers. Thus, it becomes more important to consistently expose ourselves to as many zeitgebers as we can to force synchronization between our master and peripheral clocks. In my opinion, the big 3 that everyone should focus on are light exposure, time-restricted eating, and physical activity. Many people will focus on the first 2, but I don’t believe one can ignore physical activity, and I do believe it’s important to address the other factors such as stress, sleep, social interaction, and nutrient density in order to get true circadian optimization. 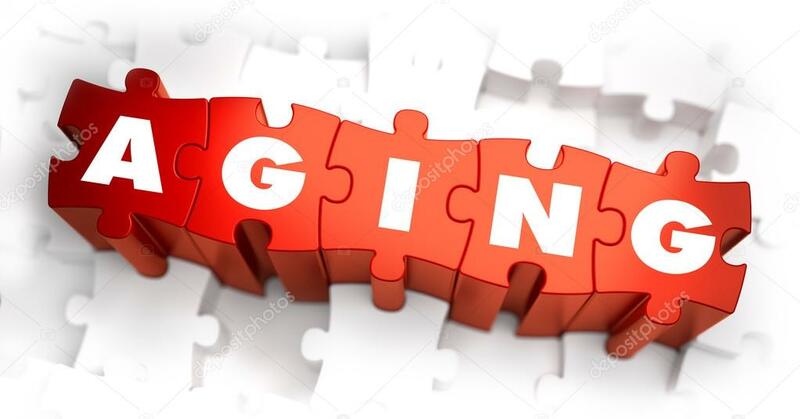 Each of the zeitgebers in some way affects the others because they regulate the same circadian hormones, and even the ones that are tissue specific travel to other tissues to exert their influence. Furthermore, aspects of aging may predispose us to dysfunction in some of these hormones. As we get older, we lose muscle mass and gain visceral fat, which makes us more prone to Type 2 diabetes and affects circadian signaling molecules throughout the body. People with Type 2 diabetes have dysfunctional cortisol and insulin signaling, which are critically important to syncing our circadian clocks. Thus it’s important to measure things that are regulated by these hormones to determine progress. By working on habits that synchronize circadian rhythms, measuring their effects, and making some tweaks along the way, we can minimize our risk of chronic disease while increasing our chances of healthy aging. “and several nutrients that power the metabolic processes that drive circadian rhythms.” What are these nutrients? Great, I will go on over and take a look. I haven’t gotten through all the files as my tablet was not allowing me. So I have to use the lap top.